Gradually over the last year, Bath & Body Works scented candles have infiltrated my life and eventually my blog posts, so its only fitting that I’m now going as far to dedicate an entire post to reviewing a candle. Bath & Body Works’ Brazilian Blue Waters is part of their Spring 2015 Hawaii collection and they describe it with the words “escape to Brazil’s shores with notes of ocean waves, sea foam and dappled sunlight”. I picked up the medium size, which is a single wick, containing 180 grams of product that should theoretically last 30-40 hours burning – this particular size retails for $12.50 or 2/$20. Brazilian Blue Waters is also available in a mini along with the 3-wick and while I wouldn’t necessarily wholeheartedly agree with the scent descriptor, I understand where they are coming from and enjoy the unique water-themed scent. 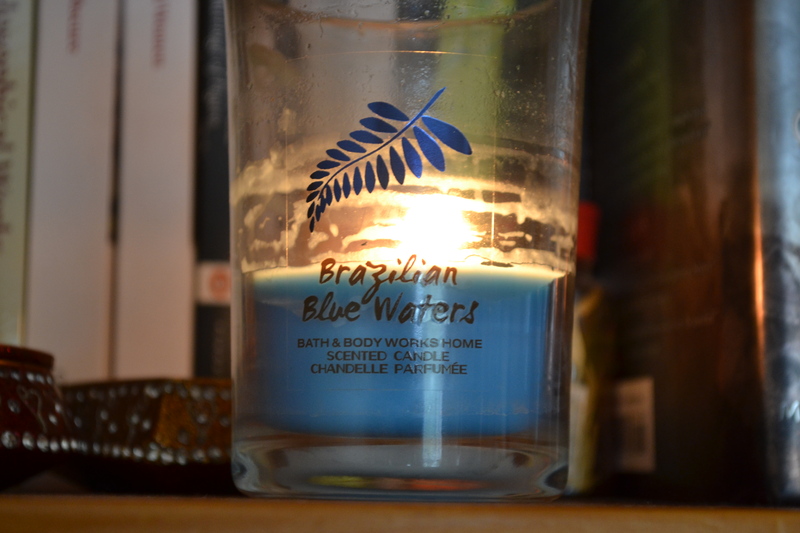 Brazilian Blue Waters is a unique scent that is subtle yet has an intense (but not overwhelming) intensity and throw and I find that I can burn it in my small room for hours without repercussions – and my room smells like it for ages after it has been burnt. While it’s definitely an aquatic scent, it’s nothing like your usual watery scents, as it doesn’t have any of those beach scents or citrus/musky hit that many other candles tend to have in this category. First and foremost, it smells like fresh running water but it has strong fresh-floral undertones along with some of that delicious clean-laundry scent. This is one of those scents that feel distinctly Spring-esque and appropriate at this time – even though here there is still snow on the ground here and it’s more of an aquatic scent. This scent strikes me as being both invigorating yet mellow and is conducive to productivity in my experience. While I have to say that I do prefer my beloved Beach Day from last year with it’s more authentic ocean-slash-beach scent, absence of floral notes and stronger citrusy musk element to it, I have quite enjoyed this candle. Even though it’s described in similar terms to the more summer-appropriate ocean scents, it definitely has a different feel that is seasonally appropriate and is a bit different in a lovely way. This is also a scent that I would hesitate to say that anyone would find offensive in the slightest. I just really do not get the sea foam note in the slightest and why floral notes were not in the descriptor. I can only imagine the 3-wick would have out of this world intensity and throw, considering the performance of the medium size. Do you have a favourite scented candle at the moment?